Each week we shine a spotlight on an inspiring woman in Ireland. This week we’re chatting to Lisa Byrne, owner of Beautique Skin and Beauty Clinic. 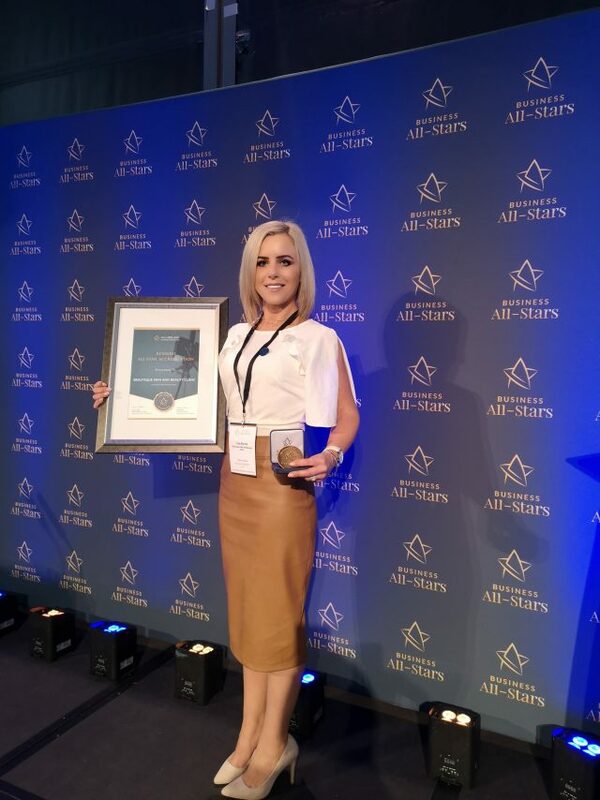 Lisa has led her company to win a huge amount of awards, including ‘Irish Beauty Team Of The Year 2018’ and ‘Leinster ‘Beauty Salon Of The Year 2017’ at the Irish Hair And Beauty Awards and ‘Irish Nail Technician Of The Year 2019’ at the Irish Beauty Industry Awards. 1. What gave you the inspiration to set up your own business? I’ve been in the salon world my whole life, I started working in my aunt’s hair salon when I was 13-years-old in maynooth at weekends and school holidays and my mam was also a hairdresser, so the salon world to me was just natural. I very quickly fell in love with the fast paced environment in a salon and making people feel so good about themselves, however it was the beauty industry that I really was fascinated by and where my heart lay. The transformation and journey a person can go through under our care in particular with their skin can be life changing to so many. From a very young age I wanted to have my own business, so incorporating the love I had for the beauty industry and my entrepreneurial flair it became my ambition to open a beauty business . After years of training and then working to build more knowledge and skill I finally opened Beautique, working by myself in a small room in a hair salon in 2010, now 8 years later Beautique Skin and Beauty Clinic has grown massively into a superb multi award winning skin clinic and beauty salon. I now have a team of 11 amazing skilled therapists who I could not be more proud of. 2. What advice would you give to any young person whose ambition it is to set up their own business? Setting up and running a business is not at all easy, it requires hard work and dedication but it is all so worth it. I love going to work each day and am still so excited when a new brand or treatment launches, I love consistently up-skilling and growing my knowledge and expertise for our 1000s of amazing clients. Growing a business won’t happen overnight but with a consistent and dedicated ambition and a drive to succeed it will happen…..Go for it! 3. You’re part of the Growing for Growth programme, can you tell us a bit about that? I was delighted to be selected as a participant on this year’s going for growth programme. I was in complete shock to be honest when I was notified in December that I was selected. Going for growth is a forum for successful business women who are serious about growing their business, 1000s apply for a place each year but only about 50/60 from. Around the country can be accepted and thankfully I was one of them. It is run by Paula Fitzsimmons and backed by KPMG and enterprise Ireland. We meet for regular round table meetings to discuss the progress of the business and a plan is put in place on how to get it to the next stage of growth. Running a business as it expands gets more challenging but with the going for growth programme I am surrounded with like minded ambitious business women who are at the same stage in building their brand so sharing knowledge and taking guidance from our mentors on the programme is an invaluable fountain of knowledge. The mentors are some of the best known and most successful business women in the country and are openly happy to help. It is also someone I am accountable to which is something that I feel lacks as an entrepreneur. Any women I know of that have completed the programme have grown their brand phenomenally with the knowledge and guidance of the going for growth programme both nationally and internationally. 4. Do you think that women are becoming more confident in opening their own businesses in recent years? I really do believe this to be true. There are so many more female entrepreneurs nowadays which is fantastic to see and there is no shortage of support and help either. I have always found Westmeath Local enterprise office here in Mullingar and particularly, Catherine Darby and Deborah Stenson to be so helpful and eager to assist any way they can. They have a really superb team there that I would highly recommend, irrelevant of the nature of your business. There are also many mentoring programmes and support networks for women now which is brilliant. 5. How do you stay motivated to run your own business and continue to motivate your own team? My passion and ambition have never over the years faded, I absolutely love my job and so do the team that keeps us motivated every day, seeing someone transform and be more confident in themselves as a direct result of our treatments is a special feeling that I cannot describe. With regards my team I’m extremely fussy on who I hire but when they are selected I believe in working on an even playing field as a team. Whole hearted trust and respect is given to each member of team Beautique, we are almost like a little family. All of the team receive up-skill training, bonus incentives, staff bonding trips abroad (I’m taking them to New York next week) and a work environment that is perfect for the creative skill they all have to flourish. I encourage staff to be themselves, we have great laughs and become friends with our huge client base which makes people feel relaxed and looking forward to their return visit as its genuine. Everyone’s core effort in all tasks daily stems back to the team, we help, guide and teach each other every single day which is just brilliant, there is a special vibe in here amongst the team that makes it so unique, I can’t put it into words. 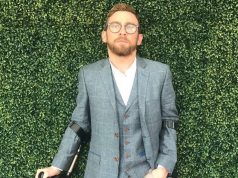 Motivation here comes from a desire to provide our clients with the very best service and result possible and the standard of work is non negotiable amongst my team of specialists. 6. 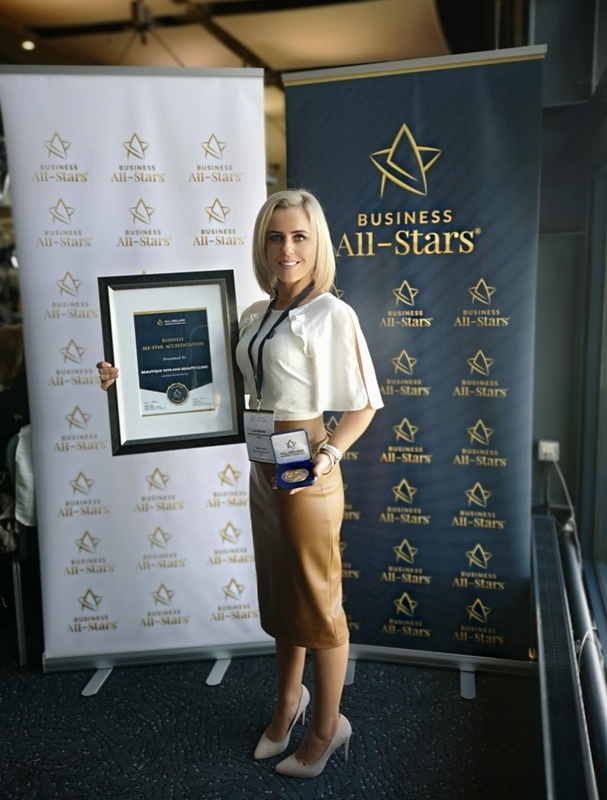 You recently received a Business All Star Award, how did it feel accepting that award for you and your team? 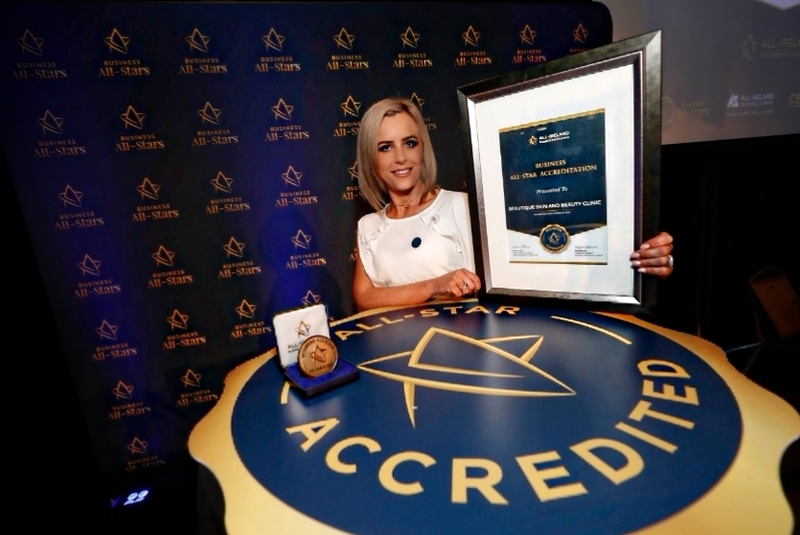 It was an unbelievably amazing feeling to accept the Business All Star Accreditation Award in Croke Park last week on behalf of my company and my entire team I felt honoured, humbled and so proud considering only 300 SME’s across Ireland have been accredited this coveted title. 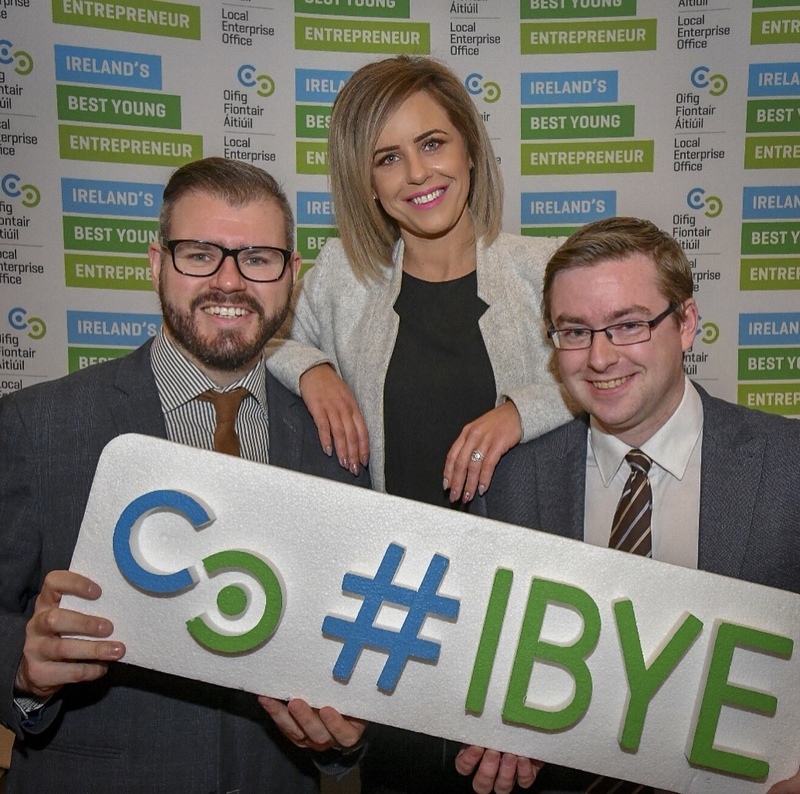 We have won 12 different industry awards over the last 2 years and I also won Ireland’s Best Young Entrepreneur 2018 in the Best Established Business Catogory which came with a whopping €15,000.00 prize fund to invest in the growth of my company. We have also won a 5 STAR client Experience Award from phorest for the past 4 years in a row 2015, 2016, 2017, 2018 for consistent 5 STAR Reviews from our 6000+ Clients which puts Beautique Skin and Beauty Clinic In the top 3% of all beauty salons, spas and hair salons in the UK & Ireland. 7. What are your hopes for the future of Beautique Beauty Salon? Where do I start! I have HUGE plans for growth and the expansion of Beautique for the very near future. I’m always researching for results driven brands to bring our clients the absolute best results possible, we have recently taken on a new Paramedical Skincare range, DMK which is extremely results driven and also henna Brows. All of the brow team here are HD trained and certified and some will be trained at master level before the summer. I have my eye on some more new skincare machines and skincare brands to add to our existing Skincare Menu which consist of IMAGE®️ Skincare, DMK Skincare, Medical Microneedling, Meso Needling Therapy and LED Light Therapy. For our current location I have a lot of plans in motion at the moment that will be revealed very soon and I am looking at other towns for a possible second location in the near future. We will continue as always to promise all of our clients to provide them with only the very best service using only the very BEST results driven global brands on the market and up-skill as products and trends progress. 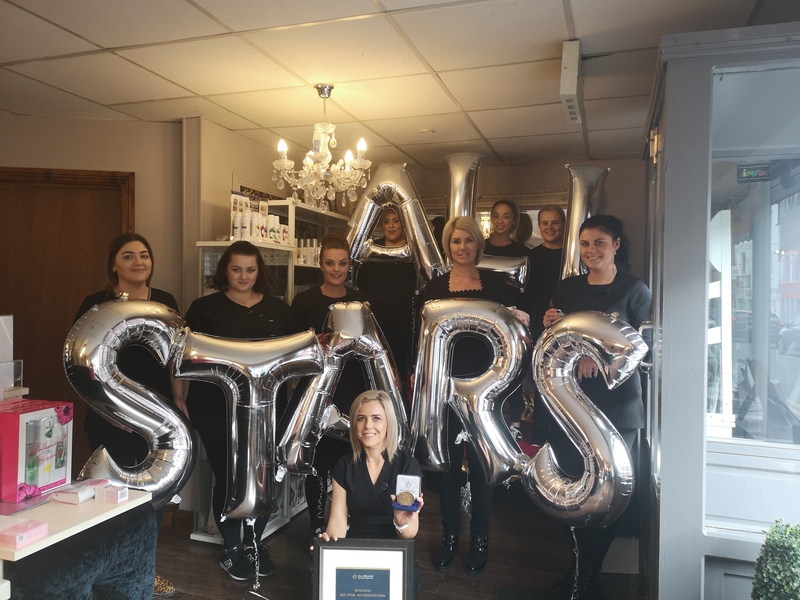 My team here at Beautique are the backbone of the business and it would not be the success it is without their dedication and drive or the thousands of fabulous loyal clients we have the pleasure of treating every day. I really have so much to be grateful for and when I count my blessings I always count my dream-team and clients twice. Amber Flanagan, Laura Sweeney, Siobhan Hiney, Leighane Fox, Shaunagh Dunne, Niamh Darcy, Monika Gawkowska, Viktorija Sakinyte and Alexandra O Connor.